The Coca Cola company’s TAB was the diet version of Coca Cola, well at least it was suppose to be. The pink can with it’s unmistakable white 70’s style writing was a great brand to look at, and during the 1970’s was at the peak of it’s success. Lets be honest, we all knew Coke was fattening, and we all new TAB was a better product, what we did not know was that it did not really do much, as the saccharin used within it was just as bad for us. Hence into the 80’s TAB had moved off the shelf. Diet Coke took over the post. The other problem with TAB was that in the main it was aimed at the women, now I never knew that in the 70s’, but I never really drank it much, I have to admit I was a Pepsi man back then. 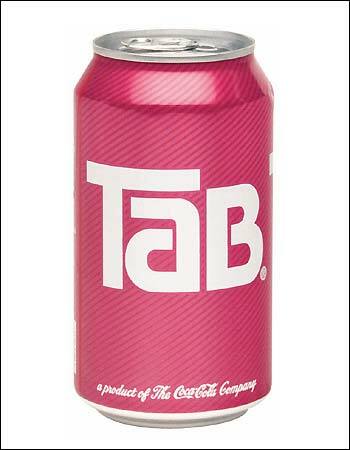 Later years showed that TAB was not as bad for health as originally shown in the late 1970’s, and although it remains in the mind, it has now vanished in most territories around the world.